It’s Homecoming Weekend at Michigan Tech! 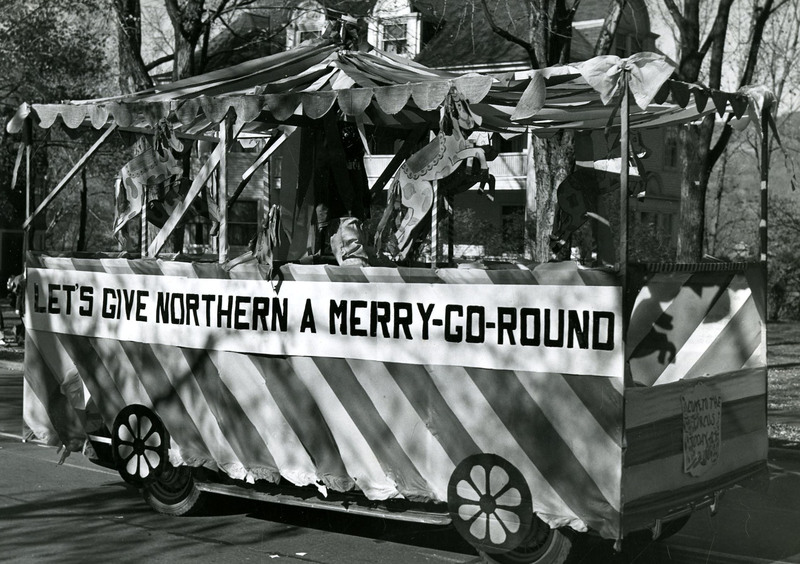 Happy Homecoming, Huskies! 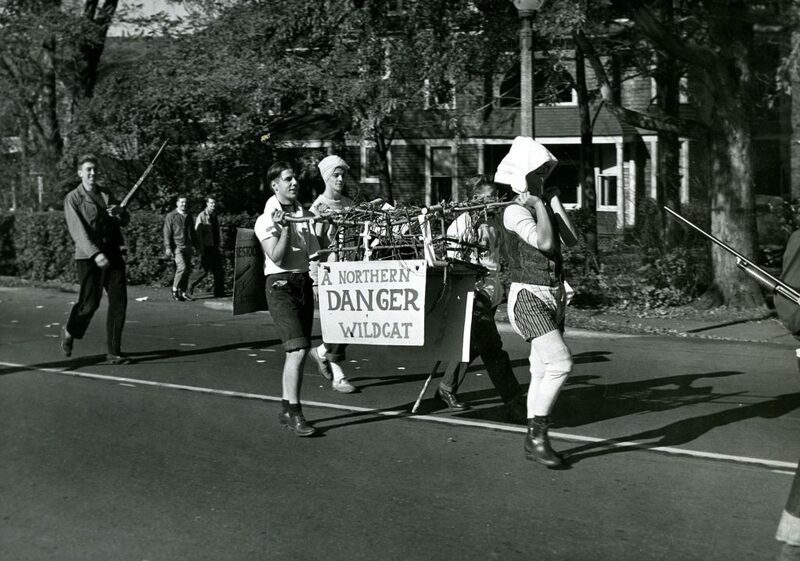 We’re honoring homecoming weekend with a flashback to 1948. 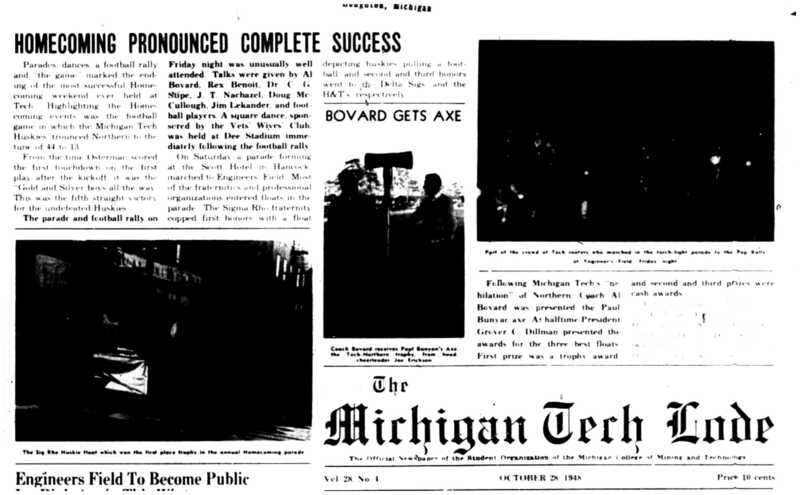 Front page, Michigan Tech Lode, October 22, 1948. Revelers then made their way to Dee Stadium for cider, doughnuts, and a square dance. Another parade was held Saturday and included floats from most of the fraternities and professional organizations with Sigma Rho winning top honors. According to the paper, Tech “humiliated” Northern Michigan University, remaining undefeated in their fifth win of the season. Homecoming Complete Success, Michigan Tech Lode, 1948. Coach Bovard was awarded the Tech-Northern trophy, the Paul Bunyan axe, from Northern head cheerleader, Joe Erickson. Football fans familiar with the big Minnesota-Wisconsin rivalry and their Paul Bunyan axe will surely be scratching their heads at that, but it seems Tech and Northern had a similar tradition. We hope that you enjoyed this flashback to 1948. Enjoy Homecoming, Huskies! We’d love to hear your favorite your favorite Homecoming memory! National Guardsmen assigned to strike duty in Calumet found themselves in the midst of a freak snowstorm. We’re no stranger to snow here in the Copper Country, but getting a taste of winter in September is unusual even for us. The bizarre weather and the tumult of the Western Federation of Miners copper strike combined to make September 1913 noteworthy for Houghton County. On September 19, what the Calumet News described as “a freakish barometric disturbance” formed over Winnipeg and began to drift eastward. As it reached the Midwest on September 20, the storm apparently stalled, pummeling the Keweenaw Peninsula for nearly forty-eight hours. The weather bureau recorded winds of almost forty miles per hour, a number more typical of November weather than balmy September. Rain and sleet fell in sheets. The precipitation and high winds downed telephone lines and cut off service to some 600 phones, mostly in Calumet and Laurium. Most notably, however, the storm blanketed the Copper Country with nearly three inches of snow. 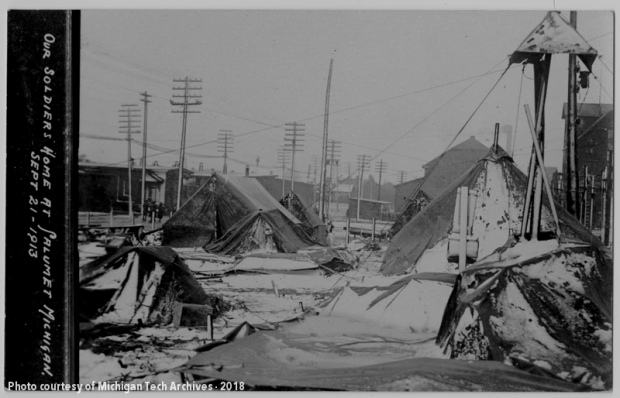 National Guardsmen called to Calumet to enforce order during the strike peeked out from their tents to find their neighbors’ shelters collapsed and coated in ice. A photographer captured five images of the storm’s aftermath in the camp on September 21, showing men with hands shoved into military-issued coat pockets, surveying the damage, squinting against the howling wind, and perhaps questioning their decision to join the National Guard. 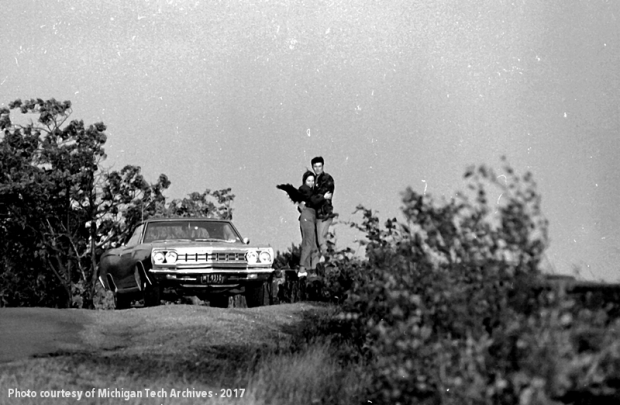 The images have since become part of the Brockway Photograph Collection (MS-019) at the Michigan Tech Archives. Tents in the National Guard encampment fared poorly in the wintry gale. It was a scene that could only have happened in 1913. 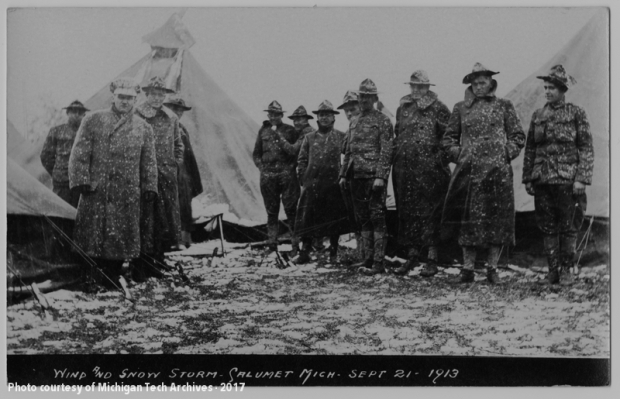 At no other time in the Copper Country history could the weather and the course of labor relations have conspired to put these men and their camp in the midst of a September snowstorm. Luckily, the forecast for Houghton County doesn’t include any snow for the foreseeable future. We will simply have to wait and watch to find out when those first flakes may fall. Anyone care to take a guess? 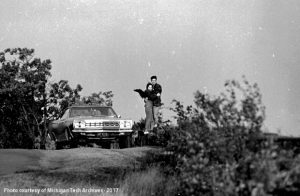 While the start of fall semester at Michigan Tech heralds the beginning of a new adventure for new and returning students, it also brings back many fond memories for our alumni. For some, it’s memories of moving into the dorms or buying textbooks; for others, it’s their first class on campus and meeting their advisers for the first time. However, most would agree that it was the student activities outside the classroom that they remember the most. Whether it was their first Tech football game or homecoming activities, if you’ve been a student at Tech since the early 1950s, you remember the fun and excitement of K-Day. A couple enjoy Keweenaw Day on Brockway Mountain Drive, 1970. 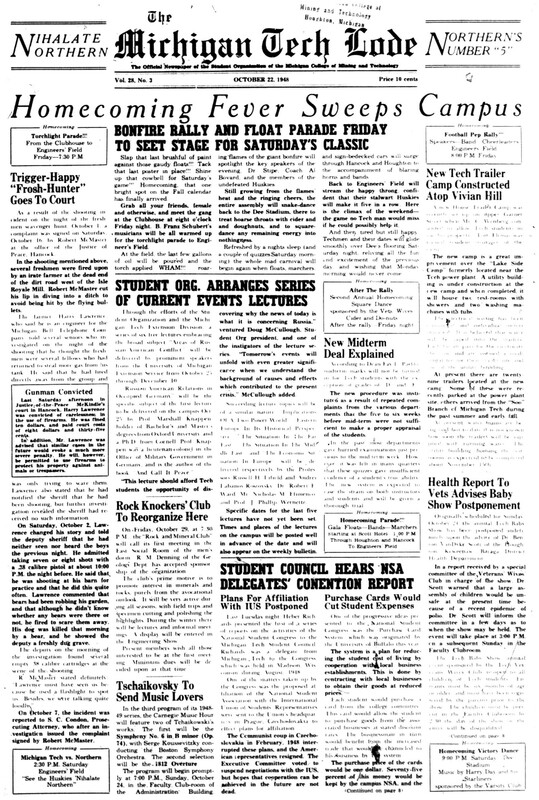 The November 1951 edition of the MCMT Alumni News reported on the success of the first Keweenaw Day celebration held on October 9 held at the picturesque Fort Wilkins State Park. 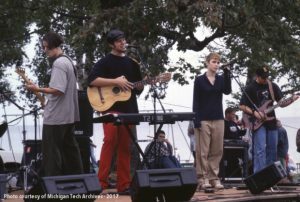 Over 1,000 members of the campus community and their guests attended the event, marking “the beginning of a fine tradition.” The sounding of the campus siren (sometimes referred to as the Engineer’s Whistle) at 11 a.m. marked the end of classes for the day and the beginning of Keweenaw Day festivities. Buses and vans shuttled people up the coast to take in the scenic vistas of the Keweenaw Peninsula. Upon arriving at Fort Wilkins, K-Day-goers were treated to a picnic lunch and a variety of activities, including games, sightseeing trips to the lake shore and up Brockway Mountain, small game hunting, and fishing. A highlight of the day was the faculty-student baseball game, pictured here. While the game was all in fun, there are rumors that the students won. 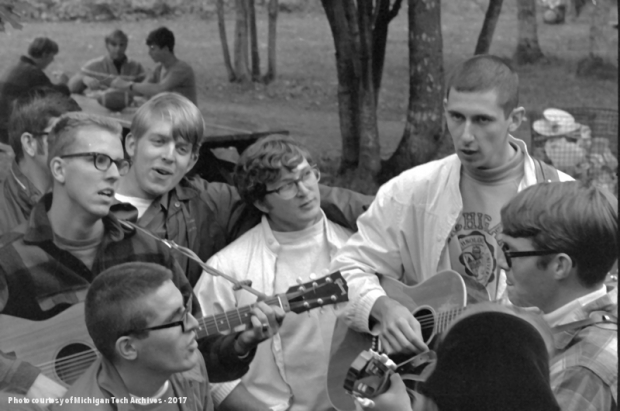 After the games and tours were ending, K-day culminated in a sing-along around the campfire. Local band performing at K-Day, 1997. The second school built at Central Mine. Photograph taken by J.T. 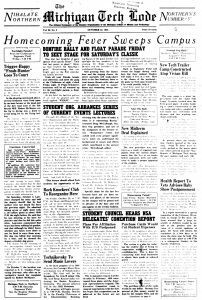 Reeder in July 1921, after the school building had ceased to serve students. I’ll admit that I have a soft spot for Central Mine, the kind of soft spot that leads a person to wander the ghost town’s hillside on weekends and affix an “I <3 Central” decal to a car. 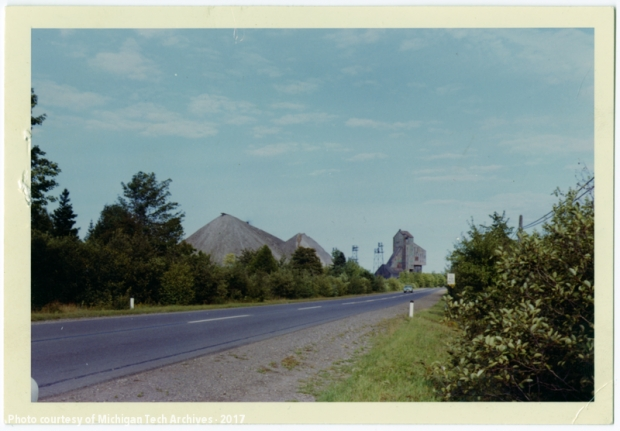 It was that affection and the ongoing pursuit of my family history that led me to investigate a thin folder at the Michigan Technological University Archives and Copper Country Historical Collections: MS-787, Central School Records. The title of the collection is, perhaps, slightly misleading. This worn, weathered volume does not contain attendance statistics, names of teachers, or exam grades. Rather, it consists wholly of annual censuses taken, presumably, by the township school board of school-age children in the Central Mine settlement between 1877 and 1890. By this first year, students had already been attending classes in Central for two decades. What, one might wonder, was the sudden urgency in enumerating all of the children in the village? The timing suggests a certain conclusion. Simply put, Central Mine was successful–too successful. The population of the town soared in response, and the small schoolhouse on the edge of the settlement had been overwhelmed. By 1877, both it and the overflow classrooms in the Central Mine Methodist Episcopal Church were strained to their limits. The townspeople realized their obvious need for a new school, and knowing how many students it must serve was a critical part of construction. 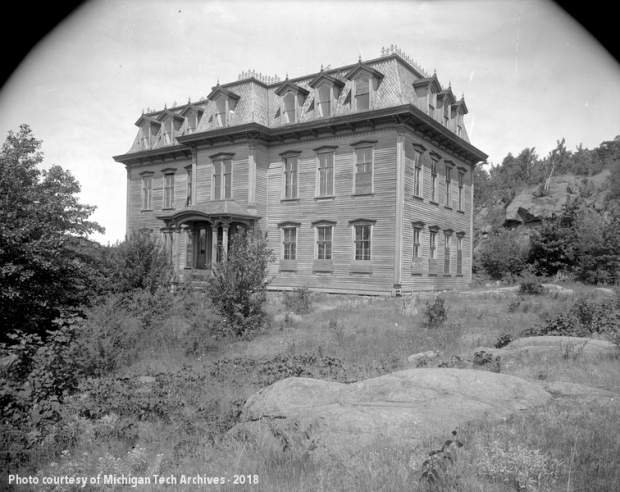 The expanded building, shown at the head of this blog post, opened for classes in 1878. How can a survey conducted to gauge the student population at Central assist you in your research? Genealogists may consider it especially valuable. Consider that, while many mining families put down deep roots, others migrated from place to place within the Copper Country, following the fortunes of the mines from Clifton to Central to Calumet. You may find that your relatives drifted to Central for a year or two before moving on to a different location, where they were recorded in federal censuses. The school census particularly proves its worth in those years between 1880 and 1890. As any genealogist quickly learns, the 1890 federal census is essentially lost, forcing researchers to compensate with other records. Along with Michigan state census forms for Keweenaw County completed in 1884 and 1894, this Central Mine collection can help to bridge the gap. In my case, I’ll always be grateful to this collection for giving me a few insights into my family tree that I never anticipated. I had two ancestors–a mother and a daughter–whom I believed to have arrived from England in about 1887, since the mother was married that year to a man with deep roots at Central Mine. I expected to find the daughter residing with her mother and new stepfamily in the 1887 school census, but she wasn’t included in their household listing. Had she stayed in England while her mother went on ahead? That would change my research in some interesting ways. I browsed through the other pages and finally found her with a family whose name I didn’t recognize. Further investigation showed that the mother of the family was the last elusive sibling in the mother’s extended clan, a woman who had seemingly dropped off the face of the earth. It turned out that she had merely moved to the ends of it instead, settling in Central with her husband and children. This was the one and only year that my ancestor lived with this long-lost aunt, who soon left Michigan, and I never would have made the connection between the two of them without the school census. This is just one of several instances where the Central Mine school census made the critical difference in my genealogical research, and it may do the same for you. Want to check out MS-787: Central School Records for yourself and see what insights it can offer? 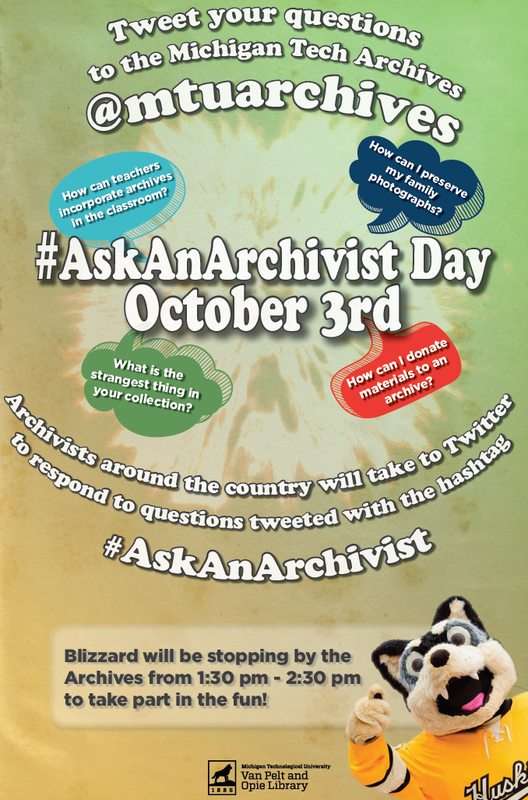 We at the Michigan Tech Archives would be happy to help you. Please feel free to stop by during our open hours (Monday-Friday, 10am-5pm), to e-mail us at copper@mtu.edu, or to call us at (906) 487-2505. Three students relax in a dorm room, 1983. It is hard to believe, but Michigan Tech’s Move-in Weekend is upon us! Move-in weekend is a big part of the new academic year as the university prepares to welcome a new group of Huskies to the Copper Country. The majority of newcomers plan to arrive sometime between 9 a.m. and noon on Saturday to get settled into their dorms, meet new friends, and start the year off right. Housing staff and dormitory resident assistants will be on campus this weekend to welcome new students and their families as well as to help students get acclimated to dorm life. 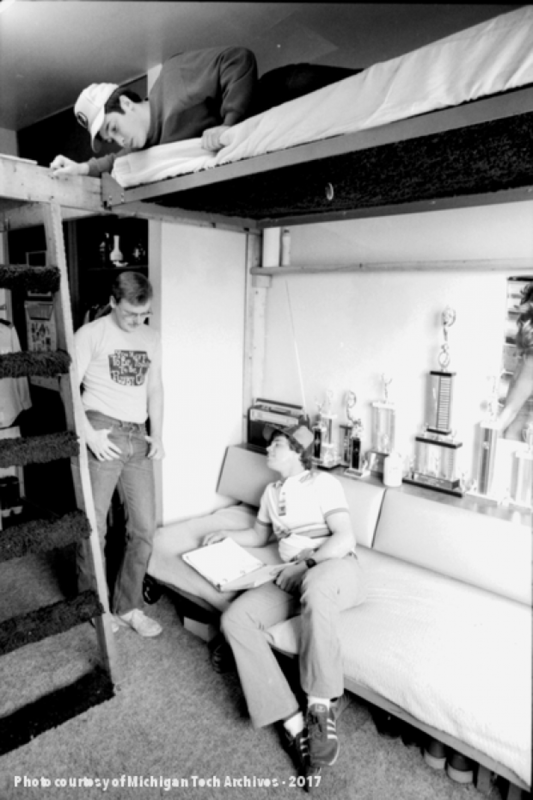 Our Flashback Friday pays tribute to all the great things about dorm life, looking back to three friends relaxing in a dorm room in 1983. The loft, a classic part of the experience, is prominently featured. For more information about Move-in weekend, see a detailed write-up on the Keweenaw Report website. It is hard to believe that summer is almost over and even harder to believe that my time here is up. These past seven weeks as the Michigan Tech Archives intern were full of amazing (and challenging) opportunities. I had the chance to experience many different aspects of the archival profession, gain new archival skills and continue to develop others. The most valuable and memorable experience from this internship is working with patrons on their reference requests. 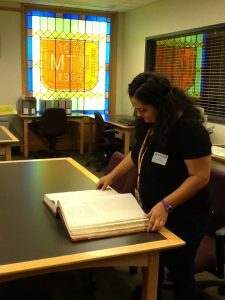 Providing access to archival materials is one of the most important aspects of an archivist’s job and assisting patrons find the materials they need can be challenging. Each patron and their research is unique and thus requires good communication skills that I developed over the course of this internship. Property assessments and tax rolls became a surprising favorite research request of mine. Although they can be difficult to understand at first, the documents provide really interesting information about the property owners and the region in general. It is fascinating to see the changing ownership of historic homes and buildings, as well as land. Overall, I am very blessed and grateful to have had the opportunity to intern at Michigan Tech University and to spend my summer in the Copper Country. This internship gave me the skills and knowledge needed to flourish as a new archivist and has prepared me for my future in this profession. 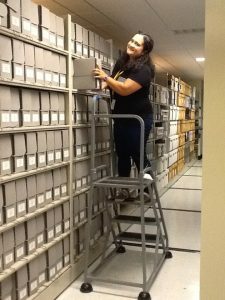 I want to again thank the University Archivist and the rest of the Archive’s team for welcoming me into their archives and guiding me along this internship. Preparing a batch of mouth-watering pasties. 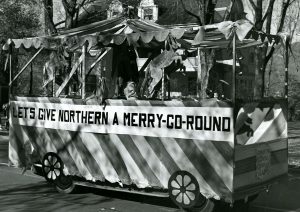 Undated photograph from the Harold Putnam Collection (MS-050). A good old Cornish song proclaims, “There’s something about a pasty that is fine, fine, fine!” We Yoopers and friends know the truth of those words. The delicious dish nourishes the body and warms the spirit with its blend of meat, potatoes, and rutabaga, all nestled inside a flaky crust. 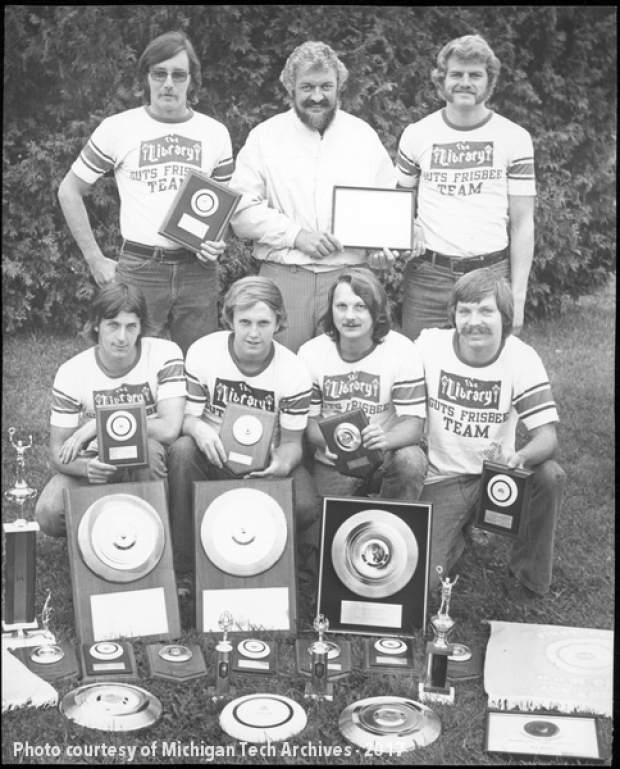 How did a meal synonymous with Cornwall become a staple of the Upper Peninsula? Cornwall’s long history of copper and tin mining led the rest of Great Britain to remark wryly, “Wherever you find a hole in the ground, you’ll find a Cornishman at the bottom of it.” Life in the mines of England often meant low wages and back-breaking labor, but it also cultivated a skill and knowledge of the work that made the Cornish miners a gold standard. As Michigan’s copper mines were first being opened for industry, their founders looked to Cornwall for able laborers, and the people of Cornwall, whose mines were tapering off, looked to Michigan for a new hope. Twenty Cornishmen, according to one scholarly history of the pasty, were already at work in the Copper Country by 1844. With them came their favorite workday meal, which was subsequently adopted en masse by colleagues of all backgrounds. One of many variations on the pasty recipe held at the Michigan Tech Archives. This one was provided by the ladies of the Calumet United Methodist Church. We don’t know for certain who invented this tasty pocket of joy, which has seen considerable changes over the years, but we do understand why it was so appealing to the men who worked in the mines and the women who prepared their dinners each day. 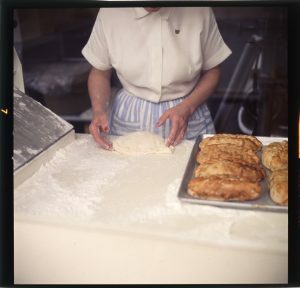 The pasty’s hearty fillings can be prepared in a large batch and energize a person for a day of hard work; the meal can be held in the hand and eaten without utensils; and it’s easy, relatively speaking, for a miner to reheat a pasty over his candle far underground. Nowadays, you’ll see pasties around the Copper Country lunch table, sold at community fundraisers, at picnics by the shores of Lake Superior, or on parade at Calumet’s Pasty Fest, held this Saturday, August 18. While we can all agree that pasties are scrumptious, debate rages about other aspects of pasty culture. Do carrots belong in a pasty? Should the potatoes be cubed or sliced? Can a pasty mascot appropriately be named Toivo? Most importantly, how can a person justify gravy when everyone knows that real pasties are eaten with ketchup?